Come join us as we celebrate our 20th Anniversary on a land tour adventure from Porto, Portugal exploring Northern Spain’s Galicia and Basque regions for its unique, architecture, culture, and food. As we continue towards France, we will cruise the famous region of Bordeaux on a luxury river cruise. It is followed by a stay in the Loire Valley known for its great wines, gastronomy, and spectacular chateaus as we conclude our celebration in Paris. Three options are available ranging up to a total of 25 days in length. This is a great value event to celebrate our anniversary with our repeat and new clients. Reserve your space soon to avoid disappointment as space is limited in various categories on this unique adventure! Meet your fellow travellers at the departure gate in Toronto airport for our flight to Porto. 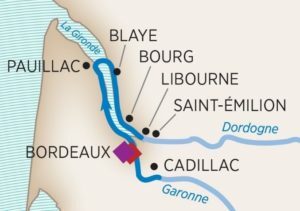 Start from Bordeaux, one of the world’s undisputed wine regions. Iconic châteaux, timeless vineyards and delicious wine tastings are plentiful as you visit Cadillac, Pauillac, Saint-Émilion and Libourne. Be treated to an exclusive experience in Bourg, featuring live French music, dancing, wine and hors d’oeuvres. This trip is a must for anyone interested in the best of French culture, lifestyle, wine, and food. You will enjoy an extensive lineup of included tours. In many cases, you will have a choice of excursions, such as standard tours, bike tours, hikes, and Special Interest Tours. We always include a large variety of activities so that you can choose how you want to explore. No matter your preference, your days will be full of discovery and wonder. Return airfare from TORONTO, please note airfare is estimated and is subject to change upon final confirmation. 10 Nights in first class hotel accommodation. Full buffet breakfast daily at each hotel. 6 Lunches and 5 Dinners on our land tour with wine. Locally guided tours as per our detailed itinerary. All gratuities for local guides/drivers services. Fully Hosted by Expo Cruises & Tours. 8 Day luxury river cruise aboard AMADolce. All your meals during your river cruise. Wine, beer, soft drinks with lunch and dinner. Guided shore excursions during the cruise. Unlimited bottled water during your cruise. All gratuities for the shipboard crew. Initial deposit of $1,700 per person is required to secure your space. Final payment is due by: MAY 9, 2019. Please note a cancellation fee of $500 per person will apply for any cancellation prior to the final payment. Save an additional 2% if you deposit and pay for your package by cheque. per person based on double occupancy and $4,195 single occupancy to the above pricing for the ultimate adventure. An AMA Waterways river cruise is about more than the destination – it’s the journey.